A dramatic late winner from Callum Lang knocked the Premier League side out on Sunday. FULHAM SUFFERED A shock FA Cup exist on Sunday afternoon, with the Premier League side losing 2-1 at home to League Two’s Oldham Athletic. Denis Odoi gave Claudio Ranieri’s men the lead seven minutes after half-time, however two goals in the final 15 minutes saw a giant killing unfold at Craven Cottage. Currently on loan from Bournemouth, 20-year-old Sam Surridge equalised with a well-struck penalty, before Callum Lang delivered a late header in the 88th-minute to knock Fulham out. The hosts had the opportunity to go 2-1 ahead, with Aleksandar Mitrovic missing a penalty four minutes before Lang’s winner. 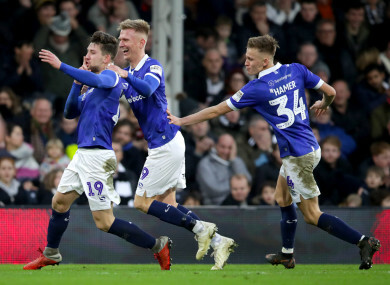 After trailing 1-0, League Two side Oldham have knocked Fulham out of the FA Cup after an amazing 2-1 win at Craven Cottage! Email “Fulham suffer shock FA Cup exit at Craven Cottage against League Two Oldham thanks to 88th-minute winner”. Feedback on “Fulham suffer shock FA Cup exit at Craven Cottage against League Two Oldham thanks to 88th-minute winner”.